I was never a soup person until, in my early twenties I spent some time working at a private golf club as a waiter. The chef at the club was fantastic, and tasting his daily soups (so that I could recommend them to our customers) converted me from a person who thought all soup tasted like tinned soups to someone who understood that flavours could combine beautifully and still taste delicious and fresh. 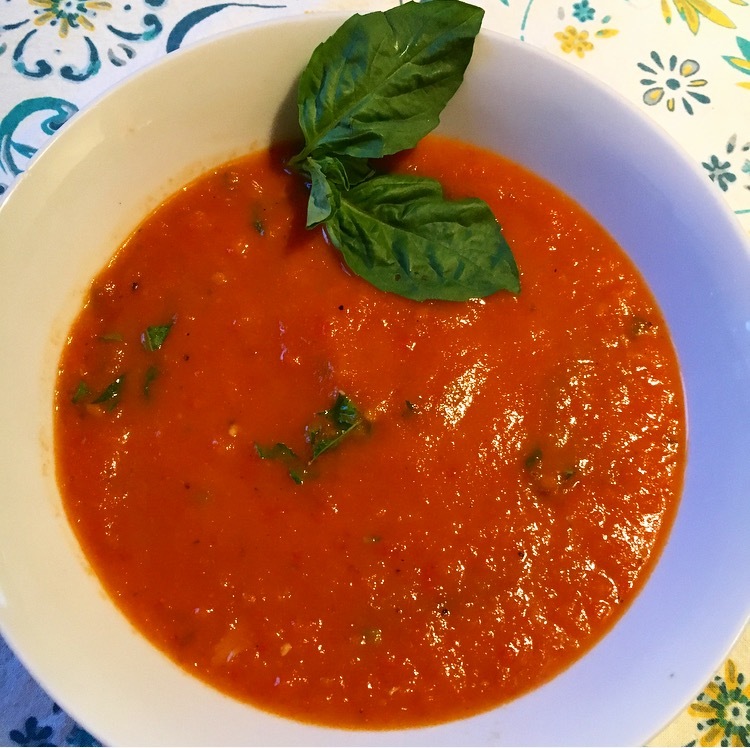 This Roasted Tomato Soup reminds me of his soups; fragrant, hearty, and bursting with flavour. It’s the kind of thing I’m glad I know how to make, especially when the Winter is lingering and all I want is something warm, thick, flavourful, and comforting. The fresh basil and tomatoes bring a hint of Summer sunshine with them that reminds me that the warmer months are on their way. 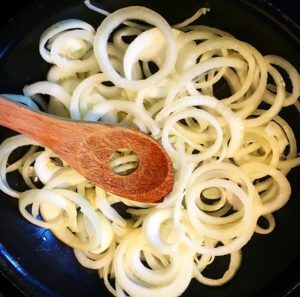 If you’re in a rush, you can skip caramelizing the onions and just give them a quick fry until their translucent, bt you’ll lose that sweet gorgeous flavour, so I recommend sticking with them – they’re what takes the recipe from pretty good to outstanding. If you want to add some protein, I suggest doing up some nice garlic-roasted shrimp and throwing them in – the flavours work beautifully. This soup also freezes really well, and is fine reheated in the microwave, so I often make up a huge batch and then freeze meal-sized portions for easy work lunches. And if you leave out the butter, the recipe is Whole30 compliant. 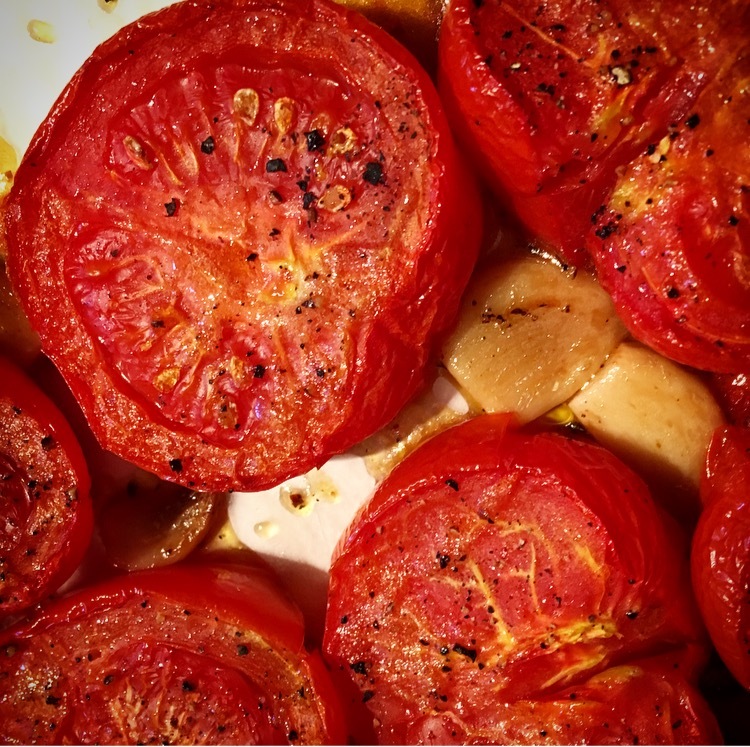 Place halved tomatoes and garlic cloves on the baking sheet and drizzle with 3 tablespoons of olive oil and season with salt and pepper. Roast in the oven for 45 minutes (watch to ensure that the garlic doesn’t burn). 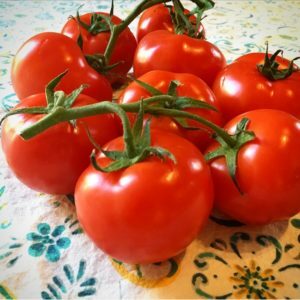 While tomatoes are roasting, add 1/2 tablespoon olive oil to a large pan and place over medium heat. Add the onion slices and stir to coat the onions with olive oil. Cook, stirring occasionally. Check onions every 5-10 minutes until they have caramelized and turned golden in color, 20-30 minutes. Remove tomatoes and garlic from oven and allow them to cool for 10 minutes. Add caramelized onions, broth, oregano, and butter and heat over medium-high heat for 10 minutes. Blend soup using an immersion blender (or pour in batches into a standing blender) until it’s a consistency that you like. Add chopped basil and red pepper flakes.